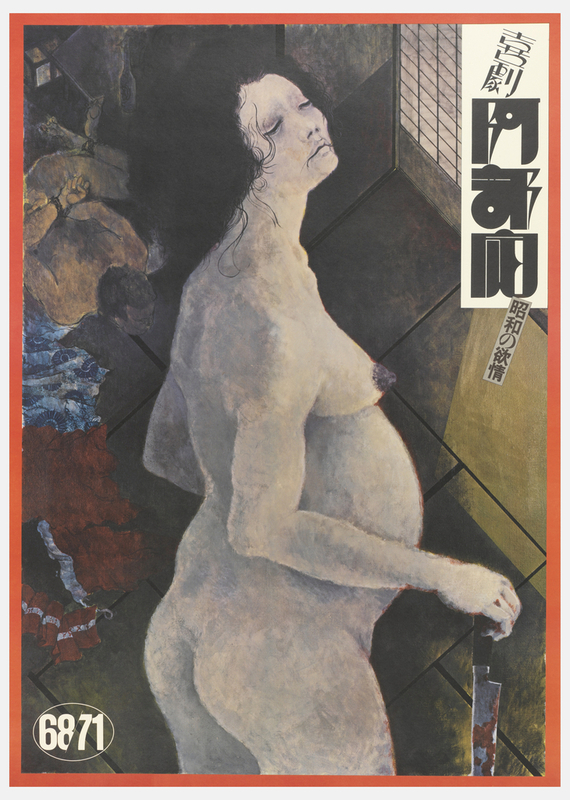 This is a poster for a stage play called Abe Sada (阿部定) performed by a Japanese experimental theatre company called Black Tent Theatre in 1973. The story of the play is based on a true murder case that rocked Japan in 1936, a notorious crime that is the central focus of the poster. At first glance, our eyes are instantly drawn to the image of a naked female figure holding a bloody knife in her hand. No emotion is found in her face. We speculate that she has just murdered someone. Then, our attention moves to a figure lying on the ground behind the woman. Now, we have a better picture. The person in the background must be a victim. This is a scene of great suffering. The letters in the title logo are hardly legible. They look like forms used in abstract paintings. With strong emphasis on geometric shapes and the unbalanced contrast between positive and negative space, the title logo that is juxtaposed with words kigeki (comedy) and showa no yokubo (lust in the Showa era) has rather an ironic quality compared to the intensity of the scene. This contradiction, however, is resolved when we understand the meaning of the title. Abe Sada is the name of the woman standing in the poster, the woman responsible for killing her lover in the throes of sexual passion. Lurid accounts of her crime depict her as mysterious or even peculiar; the title logo thus reflects Sada’s unusual personality. Koga Hirano, the designer of this poster, is well-known for his unique typographic approach. He challenges the idea of Kanji, a specific type of character, which considers a single letter to have a certain meaning. Traditionally, the addition of each character in a word builds on itself, adding layers of meaning. Hirano’s approach to typography is predicated on a different philosophy. He is interested in how individual letters form a word that appeals to viewers’ visual senses. Hirano believes that their visual experiences generate a new meaning of the word as one whole. The evocative typographic approach to the three character name of the play, Abe Sada (阿部定), emphasizes its meaning as a holistic title, rather than a series of individual meanings. The combination of the typographic elements and the sensational image of the murder creates a complex yet unique visual language, adding madness and humor to the poster. Steven Heller, “An ‘Alternative’ Designer Koga Hirano,” Print, no. 3 (May/June 1995): 42. This poster is one of Koga’s early works that employed hand lettering. Poster, Abe Sada: A Comedy, 1973. offset lithograph on paper. Gift of Koga Hirano. 1995-104-7.